Organizationally your event seems to be on the right track? You have the location, the speakers, the website is online and ready to welcome your participants? All that's left to do is to invite attendees and get as much participation as possible. Here’s where establishing a digital marketing strategy comes into play. Each event has its own story and its associated purpose. A digital marketing strategy must question, “what is the goal of the event?” and what makes this event unique?”. Use your digital marketing channels to explain to your target audience why your event raises questions that are important. Position your event as a problem solver. As a core element of your social media event marketing strategy, a branded hashtag helps you track all the important information, social media interactions, promotions and campaigns. Is your #hashtag easy to remember? If you have found a hashtag that meets these criteria, insert it wherever information about your event is disseminated. Decide on which social media channels you would like to market your event. Sort them by relevance. This determines where information must first be updated and what type of information is published in which channel. On Facebook, create your own event page that contains all the important information. On Twitter, create different tweet templates with venue, time, a short URL of the event site and your official #hashtag. Identify the Twitter names of your confirmed speakers and booked artists and talk to them through their Twitter account. On Instagram, get photos of the venue, the speakers, as well as other visually appealing information such as illustrated flyers. Invest in your cover picture, post videos and testimonials from past events, or make brief interviews with the speakers. If this type of material is not available to you, you can easily make a few short interviews through Skype or Hangouts. Once your top speakers or artists have pledged, research and share their social media accounts. They are the heart of your event. So take your time to list them correctly, stating their current position and a short biography. You can also mention their LinkedIn page, blog, or website to give visitors the opportunity to learn more about them. It’s happening only once (or at least it creates the illusion that it would be a unique opportunity not to be missed). You offer something that is unique for visitors which they cannot get anywhere else. If you organize an event in a new location and you want to make sure that you reach your target group, it may make sense to invest in targeted ads. You can use it to highlight an existing post from your brand's fan page with the event details and distribute it within the geographic environment of your target audience. When you distribute free tickets, announce in social networks that these cards are only given away to users who use the event hashtag or the official Twitter account of your brand. Calculate the cost of a few free tickets, the advertising effect is priceless. Synergy effects is the magic word in marketing: if you manage to connect with a brand that's popular with your target audience, your guest list is sure to grow bigger quickly. Nonetheless, ensure that the event should still revolves around you. Respond to every question during the event. Respond to any complaint during the event. After your event is over, use the opportunity to share your story on social media networks. Forget about storing image collections and galleries in the archive. Use tweets and Instagram photos of your subscribers for a story. You can compile the atmosphere and outcomes of your event on Storify , either in chronological order or highlighting special aspects of the event. Ensure to highlight especially relevant participants. Post a detailed review of the event on your blog. 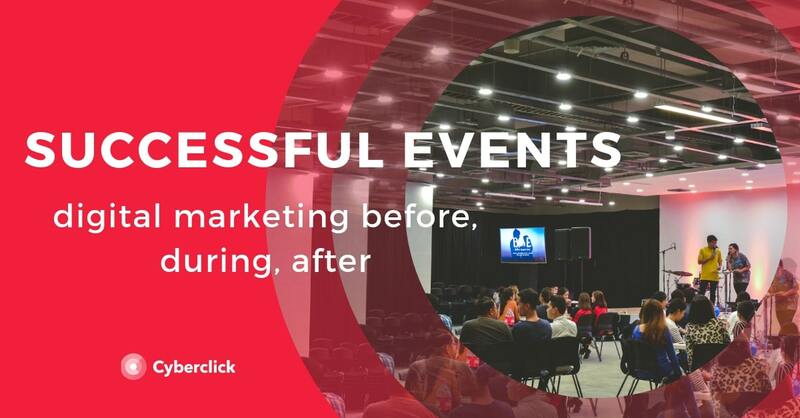 Post-event content creation and dissemination serves a dual purpose: It confirms to all those who actually attended your event that they were in the right place. At the same time your content will show everyone else - the non-participants - that it would be worthwhile to be there next time.